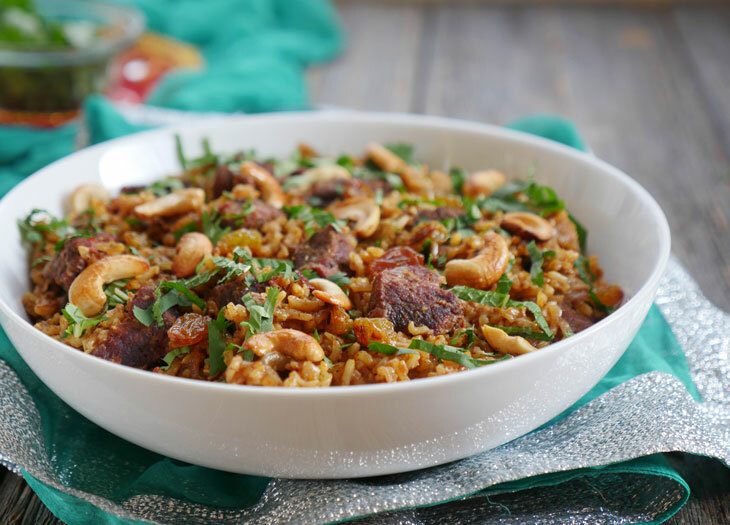 Get ready to eat this mouthwatering, aromatic brown rice biryani. Tender pieces of meat and perfectly cooked, springy grains of rice are coated in a perfect blend of spices. 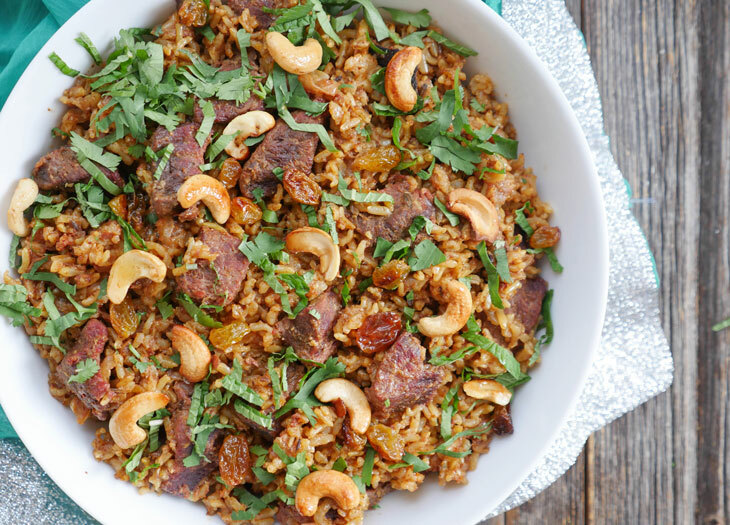 You are going to love this flavorful Instant Pot Beef/Lamb Brown Basmati Rice Biryani. 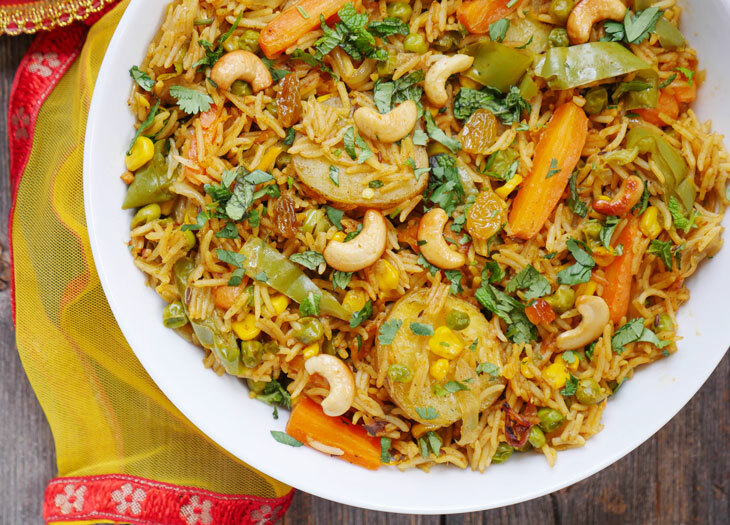 Biryani used to be a special occasion dish in our household, but now we can celebrate with this meal whenever we want. 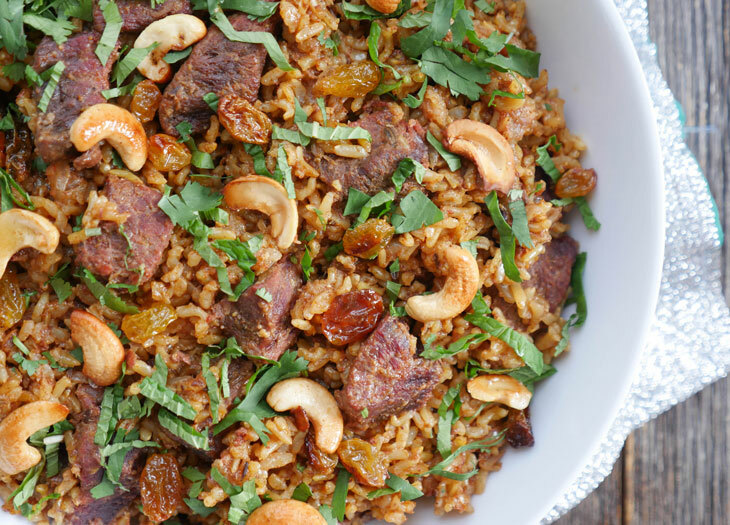 It’s so easy to make this brown rice biryani in an Instant Pot that we can even eat like kings/queens on a regular weeknight. 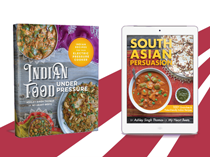 I have a delicious chicken biryani recipe in my cookbook, Indian Food Under Pressure. 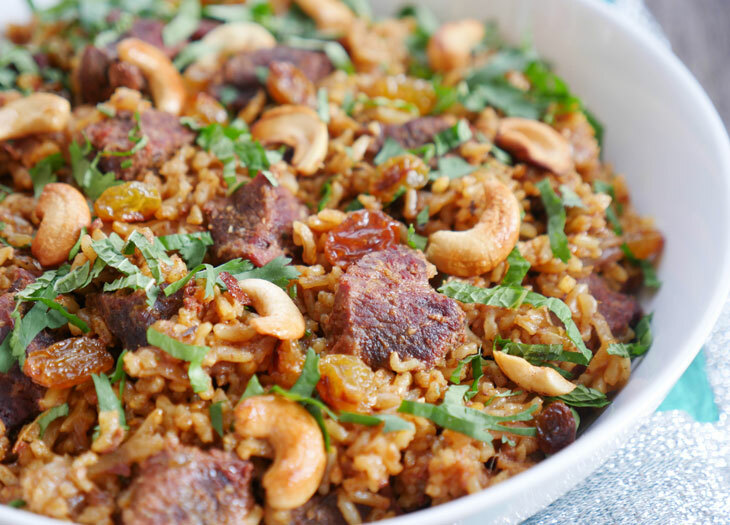 But today we are talking about beef biryani or lamb biryani depending on the type of protein you use. The great thing about cooking either beef or lamb is that it cooks perfectly in the same amount of time as brown basmati rice. If you read my post on cooking brown basmati rice in an Instant Pot then you already know it takes 22 minutes. Thankfully, you can cook beef and lamb cubes in that amount of time as well. 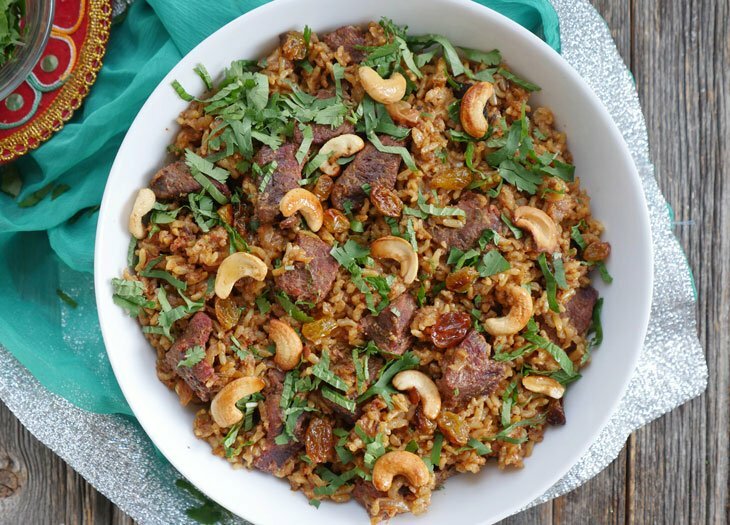 The result: tender morsels of meat mixed in nutty brown rice. 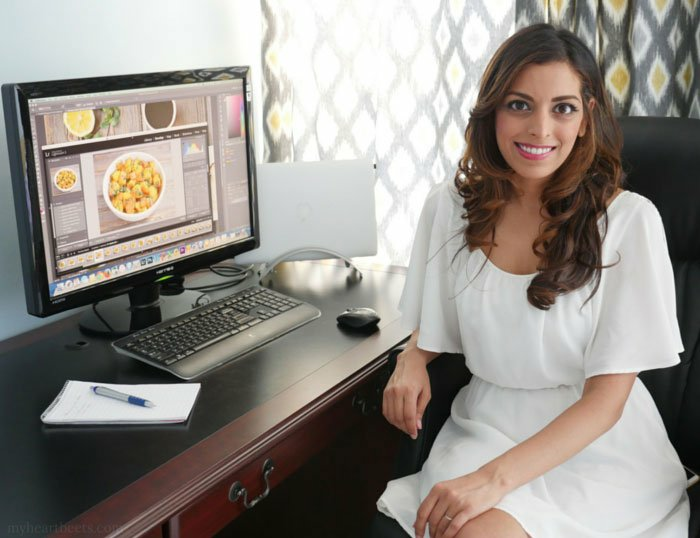 It’s no secret that I’m obsessed with my Instant Pot – especially when it comes to Indian cooking. In fact, I wrote a blog post dedicated to why this gadget is perfect for Indian cooking. The main reason: what traditionally took several pots and pans plus several hours to cook can now be made in a single pot! Biryani is an example of one of those recipes that used to take forever and was reserved for special occasions. 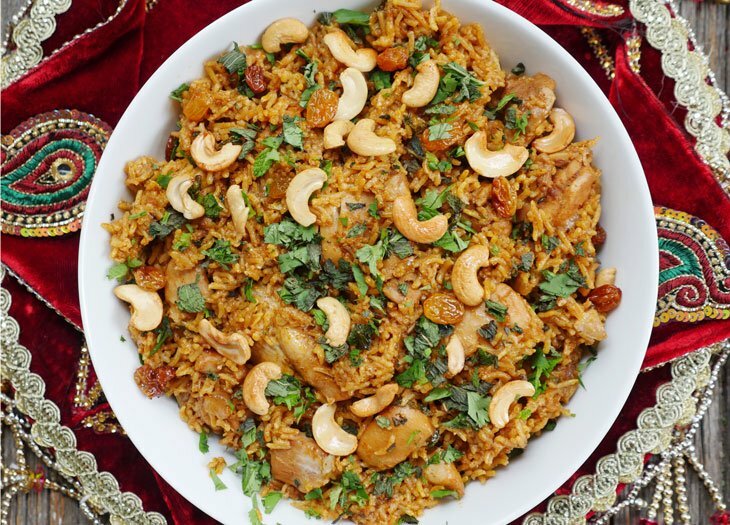 Now we eat some type of biryani almost weekly – sometimes we’ll have my shrimp biryani and other weeks we’ll enjoy some meat and rice dishes from my cookbook (chicken biryani, keema pulao, chicken tikka masala rice). 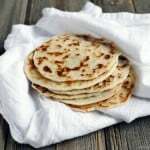 Some background on biryani: there are two main methods to making biryani: pakki biryani and kacchi biryani. With pakki biryani, you cook the meat separately and partly cook the rice then you have to layer them together then cook the whole thing together. A lot of steps, right? The only reason I would ever use this method is if I have leftover curry that I want to use (like my leftover goat curry biryani). With kacchi biryani, you marinate the meat for a long time then cook it with the rice over low heat. Then there’s my method. Skip the marinating and cook both the meat and rice together in ONE pot in an electric pressure cooker. This new method is clearly my favorite one. 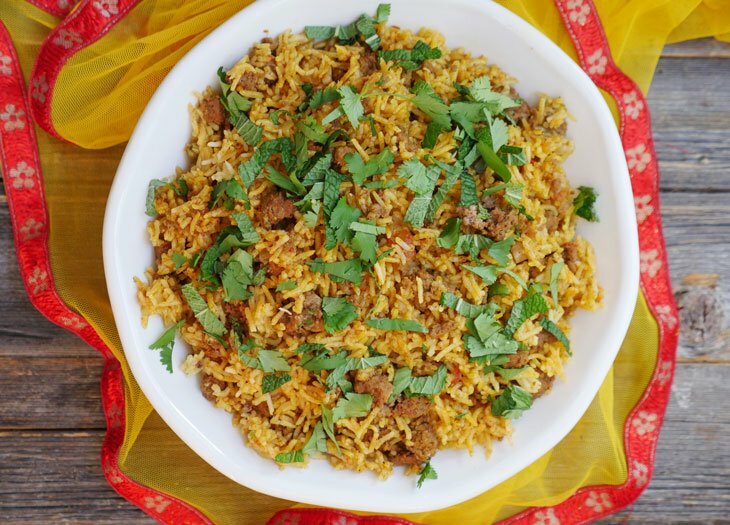 You get all the same flavor of traditional lamb biryani (or beef biryani) with the least amount of work. That said, my method works with brown rice because the cook time for the meat and the rice works out perfectly. If you prefer white rice, then you’ll have to marinate the meat overnight (in yogurt or coconut milk). I’ll put this on my to-do list if you’re interested in this kind of recipe 🙂 Let me know! Soak the brown basmati rice in cold water for 15 minutes. Drain, rinse and set aside. Press the sauté button, adjust the heat to high, and add the oil to the pot. Allow it a minute to heat up, then add the whole spices and stir. Once they begin to sizzle, add the meat and the onions. Stir-fry for 5-7 minutes, or until all sides of the meat have browned. Add the garlic, ginger, ground spices and stir, then add the rice and water to the pot. Give everything a good stir. Secure the lid, close the pressure valve and cook for 22 minutes at high pressure. Discard the whole spices, add garnish if desired and serve. While the rice is cooking, melt ghee in a pan over low-medium heat on the stovetop. Add the cashews and raisins and stir-fry until the cashews begin to turn golden. 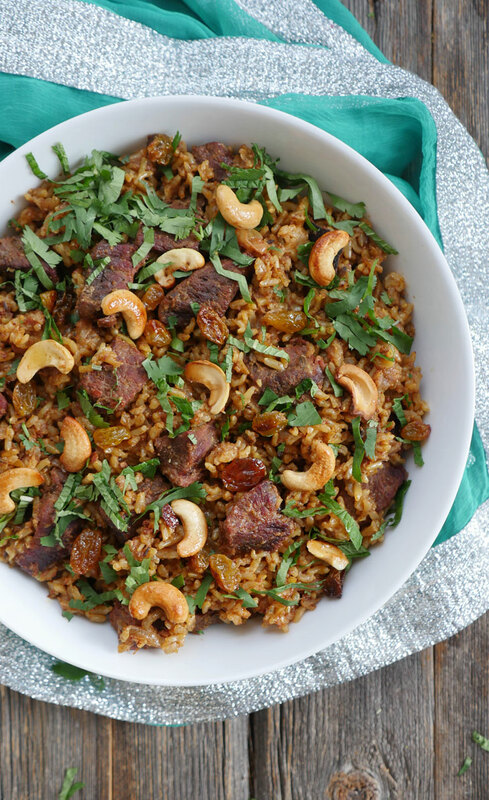 Sprinkle the ghee-coated cashews and raisins along with the cilantro and mint on top of the biryani. Ooh I would definitely be interested in the recipe with white rice! ooh looking forward to your recipe! I love your blog! Have you done one with white rice? I couldn’t find it! Love your recipes!!! Healthy and yummy!!! Hi Ashley, is this recipe possible with ground lamb? Maneesha, I am sure it’ll taste great with ground lamb! Also, if you have my cookbook you can also use ground lamb in my keema pulao recipe! Let me know if you try either recipe! Hi Ashley! 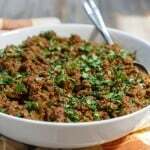 I tried your kheema recipe numerous times, with turkey, chicken, and lamb – all SLAM DUNK SUCCESSES!! I love your recipes and i LOVE your cookbook! I bought three of them – one for myself, then for my mother, and then for my cousin! That is awesome!! Thank you so much!! 🙂 I appreciate all the support!! Hello! 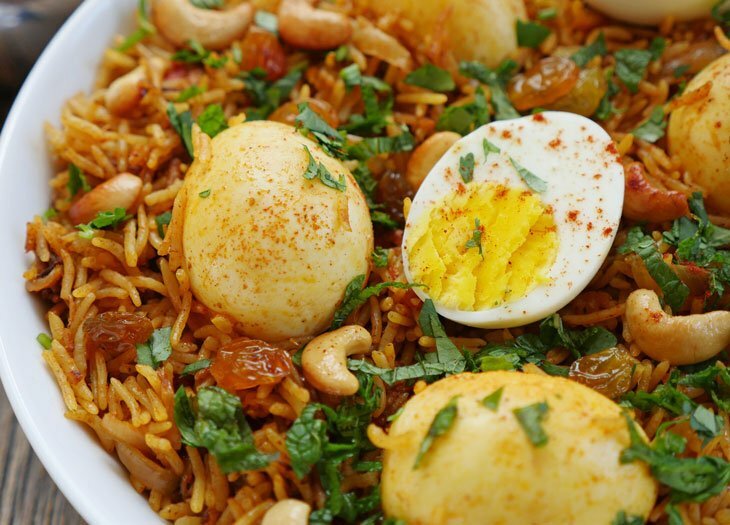 I’m a fan of a few of your other recipes and excited to try out biryani! I was wondering about increasing portion size. If i want double the amount of food, can I just double all the ingredients but keep the pressure cook time the same? Thanks! Hi Elton, glad to hear you like my recipes! I haven’t tried doubling this but I think it’d be okay – and yes, I’d keep the cook time the same. Please let me know how it turns out for you! Ashley Singh Thomas, for your brown rice goat biryani, how long would you pressure cook the goat if the meat was on the bone? I thought 45 min like your kerala goat curry may be too much? 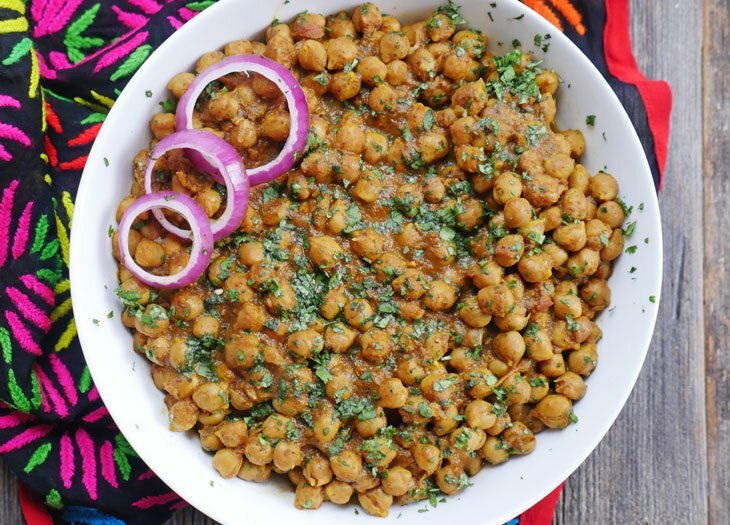 Hi Puja, I haven’t tried this with goat on the bone but I think if the pieces are small that it’ll work with this recipe 🙂 Let me know how it goes! I was really looking forward to making this. Flavours are great but the resulting biryani was too liquidy- what could have been the issue? I would like to try this recipe out but have a few questions. The recipe asks for 1cup water under the “Ground Spices” section. I am assuming this is for cooking the rice. Is that much water enough? I don’t have an Instant Pot but do have a Tefal Neo5 Secure pressure cooker. I am assuming the recipe and cook time would still remain the same right? Do you see any changes that you would recommend if any? Hi Leon, yes 1 cup of water is enough – the meat releases some water as well. Is your pressure cooker an electric pressure cooker? If so then it should work 🙂 Let me know how it goes! I’d like to try this recipe but wondering if you have a recommendation for brown basmati rice brand? I typically buy brown basmati rice from Trader Joes 🙂 It’s good but seems pretty similar to other brands I’ve tried. If I find a brand I love, I’ll be sure to update the post! Can you use regular white basmati rice? Why is the brown specifically used? Thanks! Vicki, the brown is used because it has a longer cook time and so does the beef/lamb. I plan to share a white rice version soon too but it will be a bit different as I’ll have to marinate the meat in order to get it to cook in a faster time. How serendipitous to find your website while searching for recipes to use up a pound of beef in my refrigerator. Thankfully I had all of the other ingredients (except for the mint, ghee & cilantro), and in no time I had dinner made. The only change I made was to add a bit more turmeric and about 1/8 cup water. The water wasn’t necessary, it’s just a personal preference to have some sauce. I warmed up the golden raisins in a tiny bit of salted butter. This is definitely one I’ll be keeping for family and company. Thanks! I’m looking forward to trying more of your recipes. Lynn, so happy you found my website and made this recipe! Thank you for letting me know how it turned out for you 🙂 I can’t wait to hear what you think of any other recipes you try! I made this with grass-fed beef stew meat. I made a half batch in a 3 quart instant pot. Unfortunately, the meat came out very tough. Could you suggest why this might be? Hi Kimberly, I usually make this with grassfed beef stew meat too so I don’t think* it would have to do with that… the only thing I can think of is that perhaps it has something to do with the 3-quart? Did you halve the quantity of the beef too? And you kept the cook time the same, right? 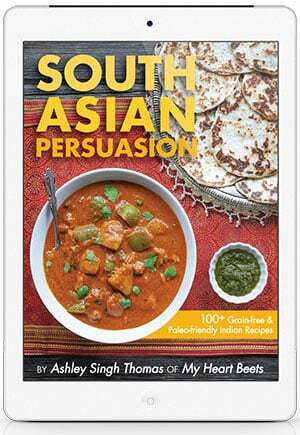 I’ve really enjoyed the simplicity and flavor of the recipes of yours that I have tried. Will definitely be trying more in the future! You mentioned the possibility of developing a biryani recipe that includes the step of marinating the meat overnight so it can be cooked with white rice. I would love to try a recipe like that, especially with coconut milk marinade. Thanks for sharing all your delicious recipes! Clara, so happy to hear that you like my recipes 🙂 Thank you! And great to know there’s interest in that kind of a recipe – I hope to share something like that soon! Thanks Ashley! 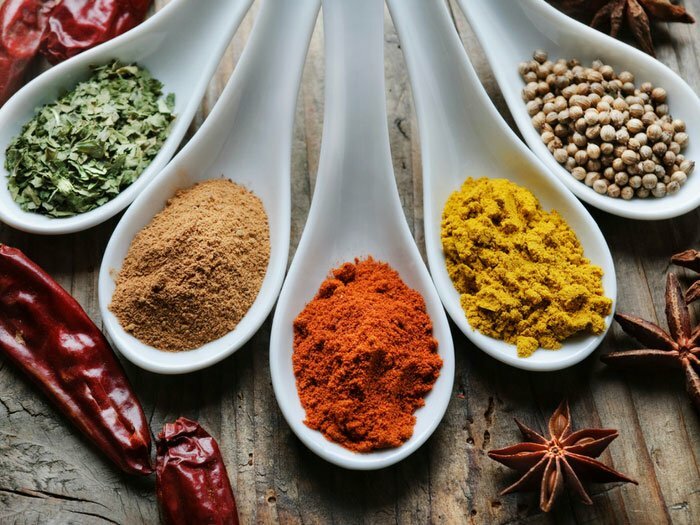 One quick question on this recipe; when removing whole spices, are you mainly focusing on the bay leaves, cinnamon stick, and cardamom pods? I assume the cumin and fennel seeds are left in? Thanks! 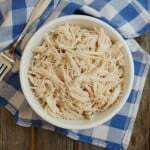 This was my first instant pot recipe after the water test and it was DELICIOUS! Just about to make it again a little over a week later. Thank you! I doubled this recipe and had no issues. This was absolutely DELICIOUS!!! I recommend using the optional garnishes, it just adds more depth. I will make this again! I have no brown basmati rice, but I do have a lot of brown long grain rice. Will this be a good substitution? Hi – I want to double the quantity of meat and rice. Should I also double the amount of water? Thank you. 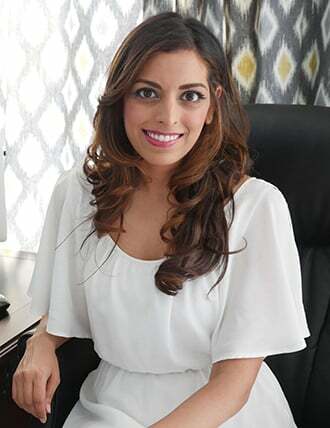 I have tried your butter chicken recipe and it turned out amazing in my instant pot! I was just wondering..with this biryani recipe how many ml is 1 cup? I am using UK measurements.